Les Cours Mont-Royal is a high-end fashion mall in Montreal's downtown core with a truly impressive selection of exclusive, renowned flagship retailers. Epic designers from around the world are represented in this space, and the on-site spa, Barbie Museum, and underground parking are all extras. Did I mention the designers who sell their wares in the mall get together monthly to put on a bona fide fashion show, free of charge? There's even a permanent marble catwalk on display for the regular occasion. 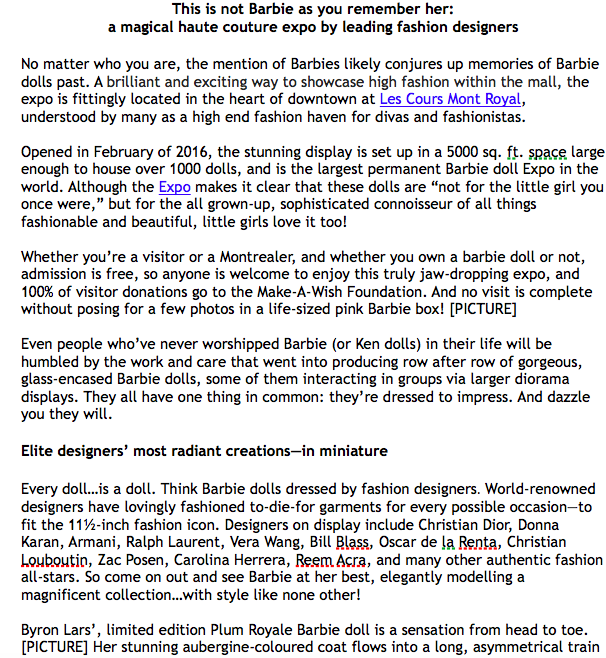 The point is, fashion is life at LCMR, and it's been really fun writing blogs, articles, wiki pages, trip advisor descriptions and web copy for an array of tenants within its walls: Boutique Monroe, Spa Diva, Barbie Expo, and LCMR proper, to name a few. 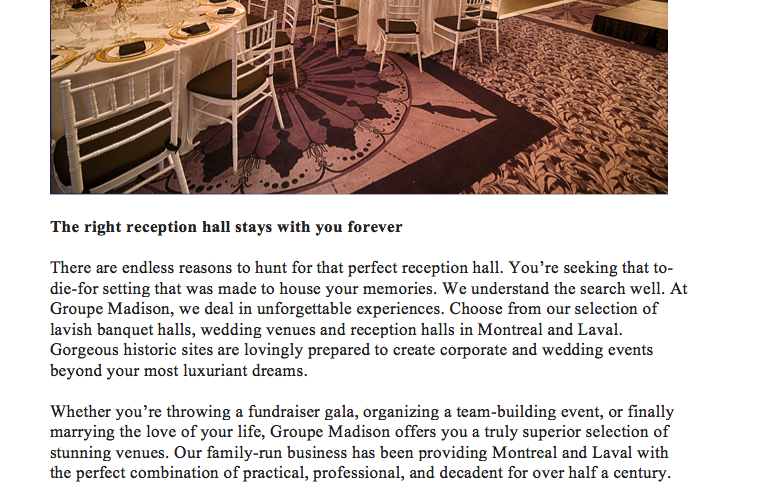 Les Cours Mont-Royal is so much more than just a shopping mall. Although the space has been modernized into the incredibly exclusive hotspot that it is today, clues to a bygone era still remain for the discerning among us: the shopping area is organized into four large courts, hence "Les Cours," and the entrance lobby ceiling is an original work of art, emblazoned in a striking blue and gold pattern that catches the light. Originally converted from the former Mount Royal Hotel, and thus built in the 1920s Beaux-Arts architectural style, there’s no better location for history-rich Montreal’s most exclusive fashion epicentre. The staff at Sky Garden Landscaping are absolute pros when it comes to looking at people's outdoor spaces with fresh eyes. They needed me to do the same for their website. 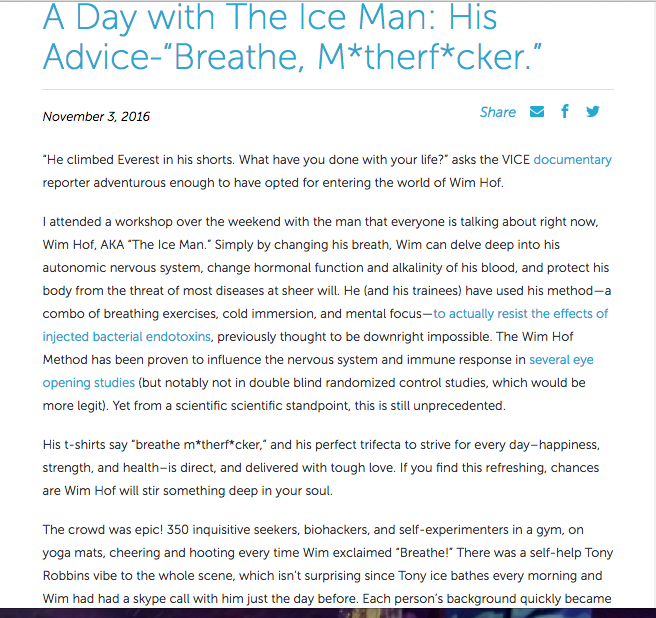 I conducted a thorough copy edit and rewrite of the content on their site. This is what you call a deluxe revamp. I lifted awkward phrases up and polished them. I cropped their descriptions and weeded out what was no longer of use. I supercharged the language on their site so the inspiring, revitalizing nature of their business could glow without obstruction. Sky Garden Landscaping is a professional, deeply creative team of designers and contractors who love to think outside the proverbial box. They're passionate about creating that outdoor space you’ve always dreamed of. They believe that nature’s healing powers and the landscapes that foster them should be accessible to everyone. Practicality and aesthetic beauty are equally at the core of their process. Their specialty: SkyGardens, of course. They harness unique combinations of texture, pattern, colour and space, to transform your balcony into a beautiful, healing sanctuary. I'm in a very happy, long-term relationship with Rank Media. Going on three years now. 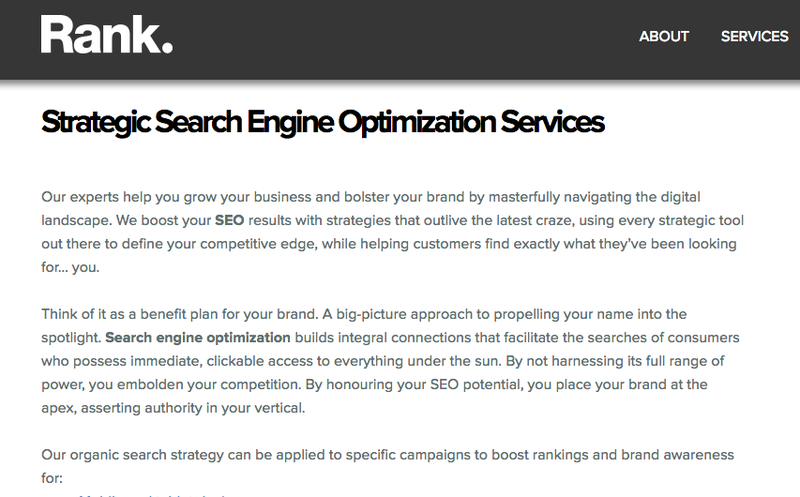 I write finessed, supercharged descriptions for their site about the integral roster of services they offer their professional client-base, and have covered digital strategies like SEO, paid media, online PR, social media marketing, and email marketing, as well as custom development services like e-commerce, custom software solutions, mobile apps, and website development. I make Rank’s diverse clientele happy too. We’re talking condo companies, mobile apps, fashion start-ups, restaurant franchises, and beauty products—to name a few. Clients I've worled with through Rank include: Veri, Mondev, Dev McGill, Dunn's Famous, Fabricville, Clearit USA, Aosom, Corporate Stays, Ziggit, Ville Marie Collection, BuyHealthInsurance.com, and many more. Whether it’s writing or editing copy, SEO copywriting, blog posts, email campaigns, articles, or press releases, desirable, powerful messaging is achieved on the regular. Looking forward to many more years of potent wordsmithing and result-oriented, evolutionary thinking for these guys. Circuit+ Fitness was on a mission to reinvent their image and come out on the other side with an edgier angle, and a more community-oriented feel. One of Kuwait's premier fitness initiatives, these guys operate gender-exclusive centres across the country. Writing the web copy for their new site, fashioning decisive calls to action, and dreaming up taglines that represented their values was a fascinating excercise in employing relatively conservative language while maintaining a certain edge. A very fine balance. I wrote the crossfit, bootcamp, yoga, home training, and diet pages for their website, and they were extremely pleased with the end-product. Circuit+ was founded with high hopes: revolutionize the concept of fitness in Kuwait, one discipline at a time. They provide their members with a wide variety of community classes aimed at improving their quality of life. Their multidisciplinary approach is such that members can choose to focus on one discipline and perfect it, or else leave their comfort zone and try something new. Their facilities are incredibly well-equipped, and staffed with seasoned experts who are sure to help anyone turn over a new leaf. 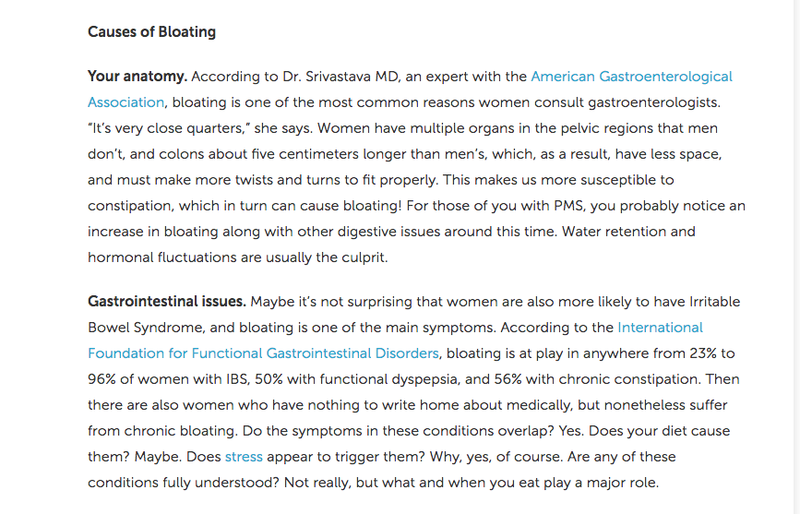 Being Urban Wellness Clinic’s go-to blog writer has made me smarter and healthier. For close to two years now, I’ve been their main source for blog writing and editing. I produce two intelligently thought-out, well-researched, timely blogs every week, spanning a range of health and fitness topics, including but not limited to: chiropractic, yoga therapy, sports injuries, acupuncture treatments, massage, physical therapy, corporate wellness, diet therapy, prenatal care, and more. At times, the writing has necessitated interviewing staff at the Clinic. My work with this deeply knowledgeable group of healers and their important work has been a joy. 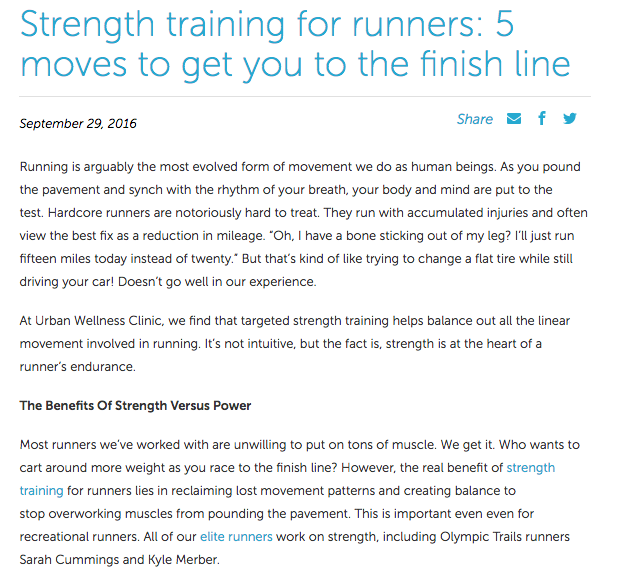 The Urban Wellness Clinic crew in NYC are highly skilled movement experts. That means: chiropractic doctors, physical therapists, personal trainers, athletes, nutritional therapists, acupuncturists. They make it their business to help people move smarter, better, and pain-free. My work with Moonlight Writing is most definitely a labour of love. 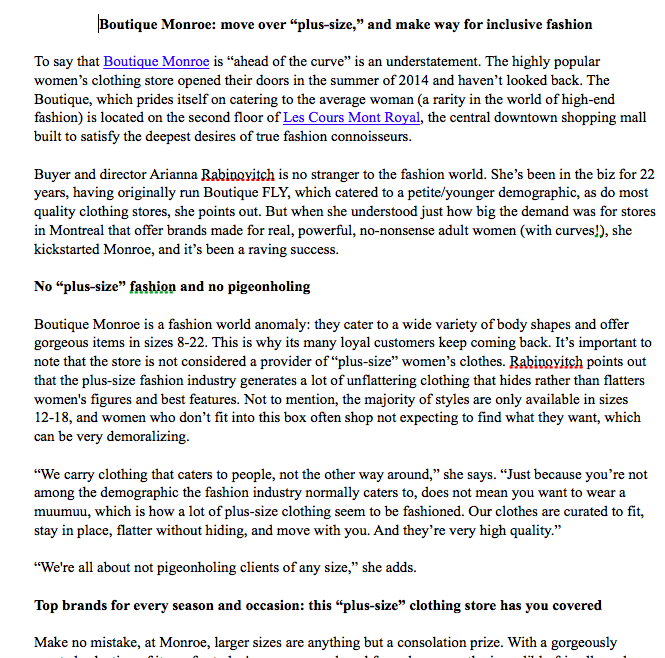 I translate web copy and blogs from French to English. The work goes far beyond translating the words themselves. Adaptation may be a more apt description: I preserve original nuance in such a way that allows real, true meaning to not only survive, but thrive. All of Moonlight clients have a common denominator: they are growing businesses with a pressing need for persuasive written advertising material and internal documentation to support an expanding infrastructure. Businesses around the world turn to them for bilingual content, corporate writing, community management and translation. I got to put my food and fashion sense to good use with the likes of Quench, who are a tad too cool for school. 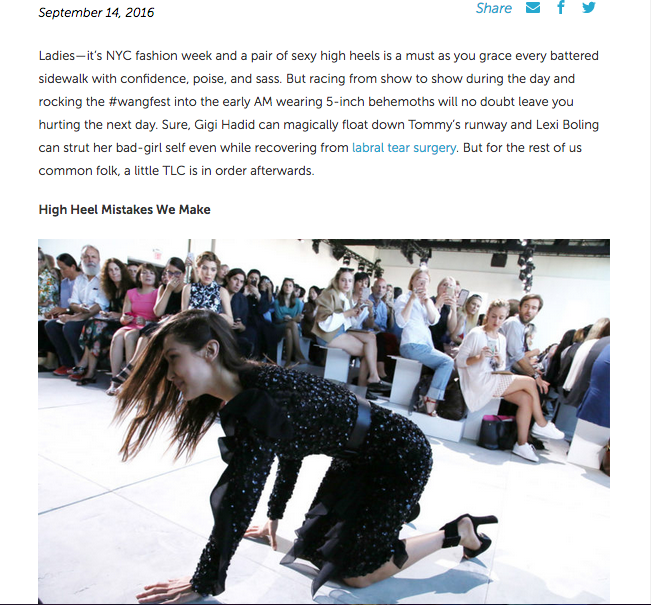 Was a lot of fun to join their ranks of skilled bloggers for a time, and I look forward to doing so again in the future whenever the need (or fancy) strikes! Quench magazine is about a lot more than eating and drinking. They've made it their mission to discover titillating places, experiences, rising trends and new flavours, and share them with the everyday gourmet. 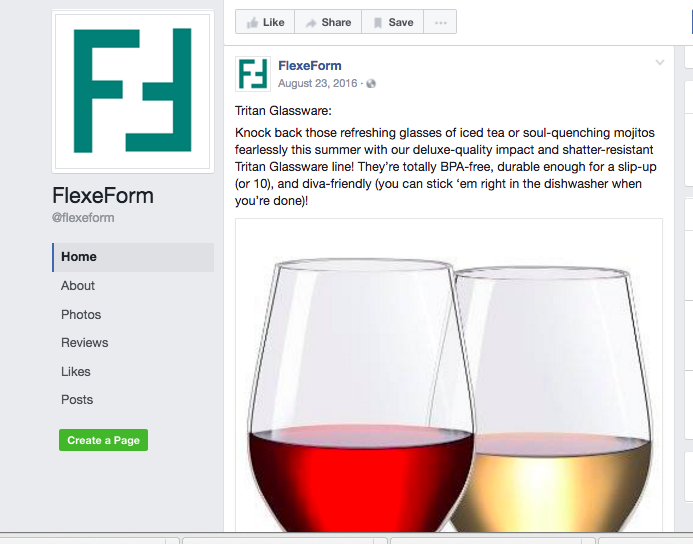 For close to two years now, it’s been my pleasure to work with Flexeform. I write their promotional campaign emails, social media posts, blogs, and fulfill their clients’ copywriting and editing needs, whether it's a thorough proofread of product descriptions that's needed, an About Us page that needs personalizing, or a list of services that needs fleshing out. 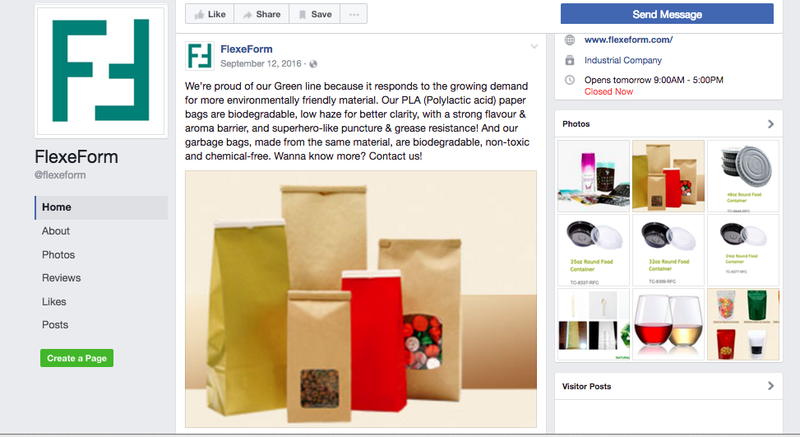 Flexeform Enterprise Inc. is a Canadian company that has built solid partnerships with multiple manufacturers in both Taiwan and China. They produce top quality eco-friendly plastic packaging, containers, and labels. You can expect to find the most innovative products at the most competitive price in the North American market when you contact this brilliant team. Working with Elizabeth to get to the root of her passion for fashion, business, and Peruvian culture was an exercise in synthesizing and harnessing empowerment. I interviewed her and her husband extensively in order to produce quality copy for their site. The result was nothing short of potent and poetic storytelling. I enjoyed every moment of it, and Elizabeth was in love with the final product. Elizabeth Lozano is committed to offering women gorgeous, high quality corporate wear that is made to actually fit their bodies and flatter their form. Imagine that. Her specialty: custom-made button-up shirts and handmade silver cufflinks lovingly crafted in her Peruvian homeland. My work with the Assistance and Referral Centre for Health & Social Services (ARC) involved coordinating firsthand with Project Management Consultant Katherine Quast to set up and conduct and publish interviews with caregivers, digest complex information from a variety of sources, and turn it into friendly, accessible, easy-to-understand content for ARC's membership, in the form of politically pointed articles and blogs. I also managed their social media accounts, and developed effective social media strategies to suit their unique needs. 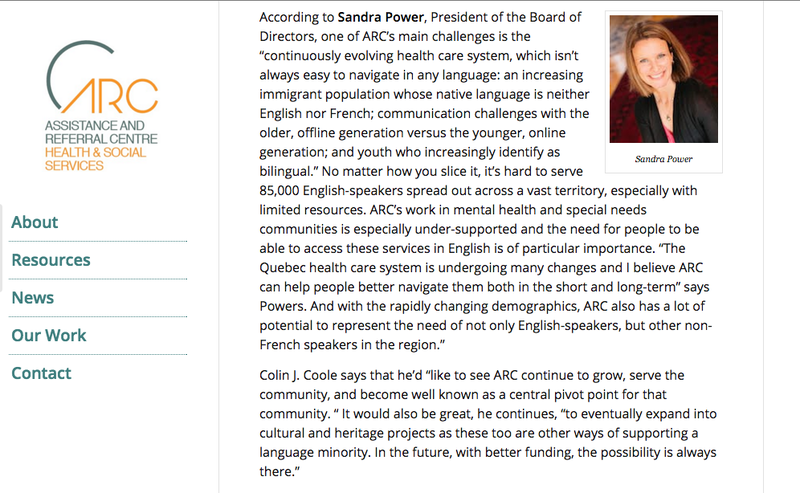 ARC does the important work of ensuring that Anglophones living in Montreal’s South Shore region can access healthcare in their first language. Working in partnership with public and community actors, they contribute, connect, and share resources that promotes access to health and social services in English, collaborate with service providers, community organizers, and individuals on community-wide initiatives, develop community awareness of the need for services in English, and support recruiting and retention efforts so there are more English-speaking professionals working in Quebec's health and social services system. I help The Creative Copywriter achieve their lofty yet totally attainable goals on the semi-regular, having written educational, funny, and informative blogs and articles for their clients (as the case may be). I’ve written about dating, relationships, the importance of performing background checks on yourself and others, and lots more. They like my versatility and punctuality, and I quite like their edge. And grit. And fresh-faced love of the craft. I enjoy working with anyone who champions the creative spirit, and doesn't shy away from bold statements. These guys. 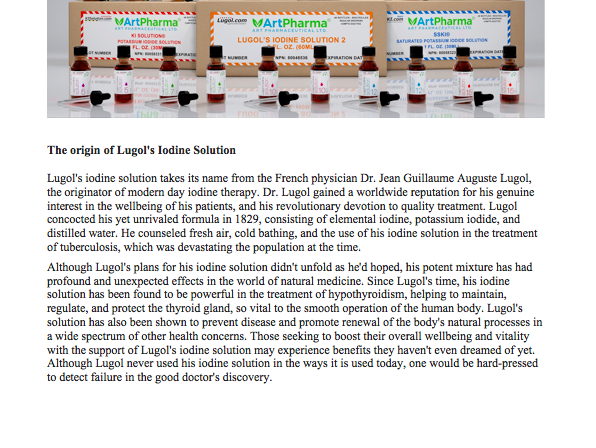 I worked with Lugol on the creation of meticulously researched copy, product descriptions, and a detailed history of their revolutionary iodine supplement—a product I stand by. The work involved hours of interviewing, researching, and revising. But it was all worth it, and I'm proud to have played a significant role in helping to get this important health and wellness information out to the masses. Lugol's Iodine Solutions can have incredible health benefits for human beings, especially those suffering from disorders of the thyroid. Many of their customers are seeking these same benefits and demanding better quality products. But before Lugol.com, the market was flat-out unregulated and unsafe. 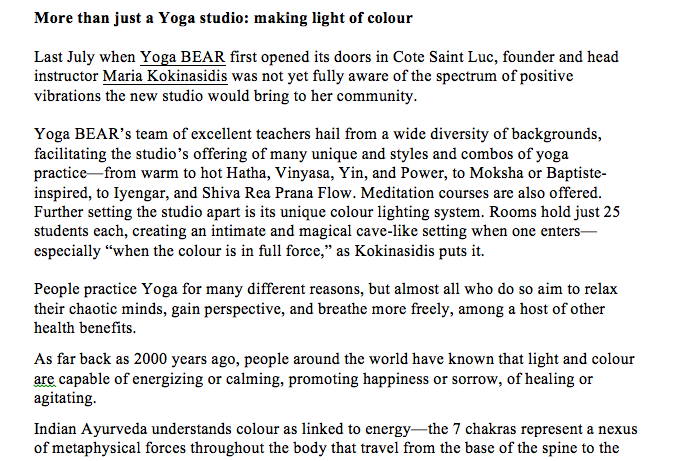 I acted as social media strategist, blogger, and copy editor for Yoga BEAR in the lead-up to an important yoga teacher training they were hosting. 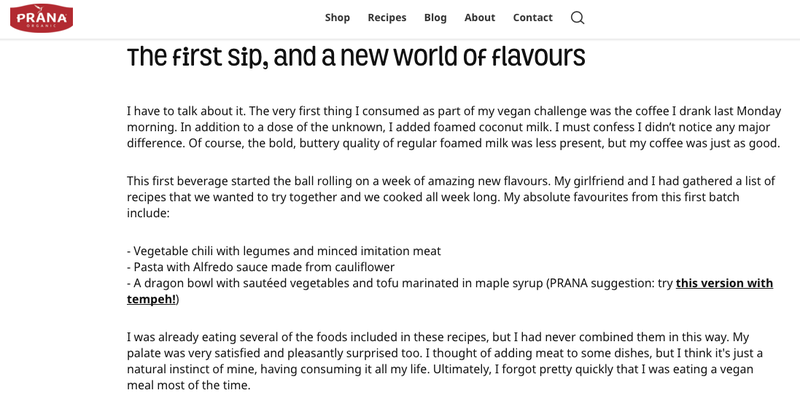 I edited web copy to improve their site's exisiting content, crafted strategically targeted promotional emails, and wrote engaging, educational blogs for their readers and yogis-to-be. Many of Yoga BEAR’s head instructors are well known, respected, and loved in the Montreal community: Author and mentor Bram Levinson, Albert Belshak Bissada, and Karen Gozlan among them. I wrote all the copy for Aqua+ Skincare's anti-pollution face cream. Their communication goals were multi-pronged: legitimize the authenticity of their product; set it apart from all the other skincare products claiming to be natural; establish a direct line to the beauty needs and wants of the modern, busy woman; and break down the scientific functionality of their product, ingredient by impressively natural ingredient. 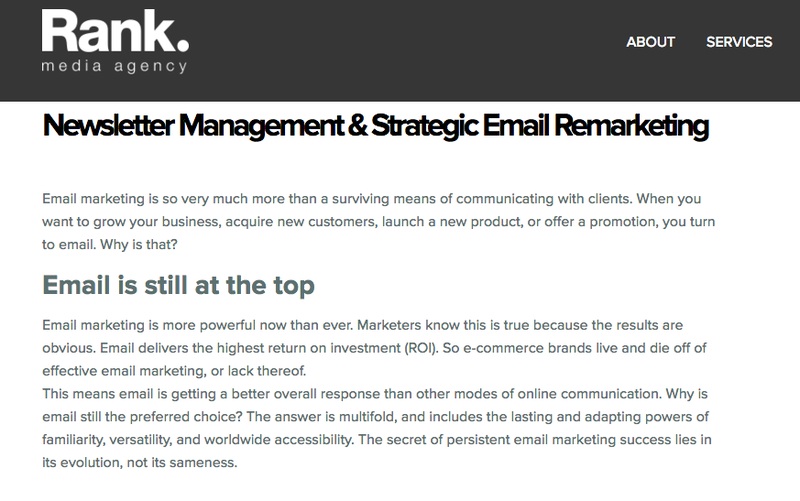 Today their site reads poignantly (and looks amazing), and their business is thriving. Aqua+ Skincare products not only work to counter the inevitable effects of pollution! They also possess a range of antioxidant and anti-aging benefits. What's not to appreciate, here? One of the best natural skincare products on the market, AQUA+ Skincare Anti-Pollution Cream contains apple fruit extract to prevent wrinkles, dryness, itching and cracking. Honeysuckle flower extract works to reduce free radical damage, repairs skin collapse, restores skin tightness, and fades wrinkles. Aloe leaf juice is added to the mix because it’s rich in vitamins, amino acids and water, so it nourishes and moisturizes. That's just the tip of the iceberg! I edited a large batch of web content for this incredible healing collective, run with women's reproductive and sexual health always in mind. They required soulful, earthy language to effectively embody who they are and what they're about. Women's health happens to be my passion and specialty, so suffice it to say, the results were fruitful, and I hope to work more with these great people in the future as the need arises. Creative healing by and for women. That's Toger Lotus' tagline, and rightly so. 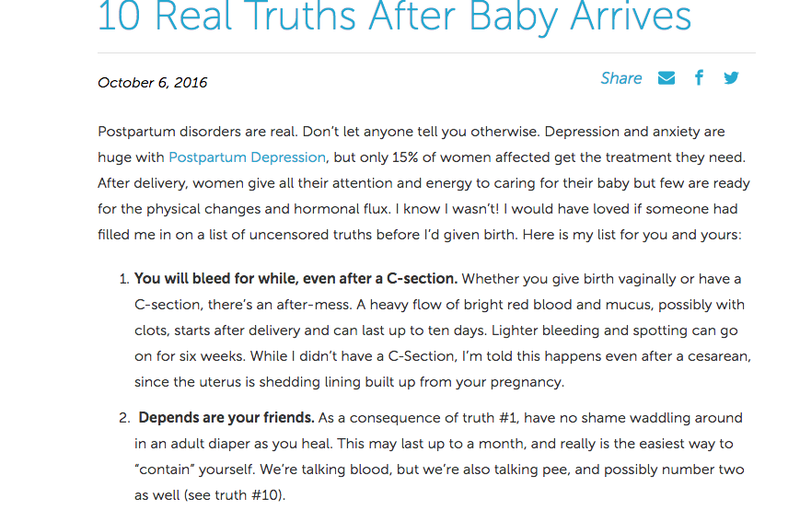 They offer an array of revitalizing services for moms-to-be in particular, and women in general. From Thai Yoga Massage, to Green Clay Treatments, Ayurvedic Consultations, Prenatal Massage, and lots more, these amazing women provide an incredible, empowering service to the community. 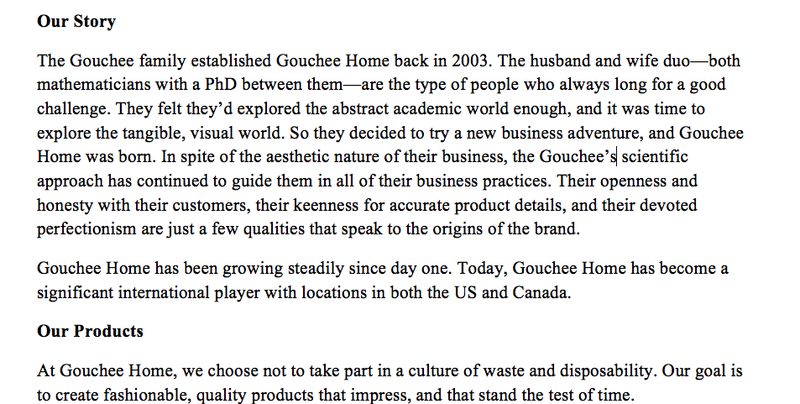 Gouchee Design got in touch because they needed some clean, clear, professional copy to tell the story of their origins while reaching out to their clientbase, as well as an entire roster of product romances to get their point across painlessly and without fanfare in clear and accessible language. They got what they asked for, and it was fun digging deeper to get to the root of their company's humble beginnings. The team at Gouchee Design are international B2C specialists in the drapery, pillow, bed sheet, and kitchen linen biz. They import and wholesale home linens and hold proudly to their philosophy of sustainability and quality over cultures of disposability. Their product line is diverse and colourful. Their mission: to sell beautiful, durable products that are designed to last. I’ve been working with Fan Fuel for a couple of years now to equip them with top tier copy and social media posts that cater to their wedding, entertainment, and catering industry clients’ upscale customer base. Make no mistake: the cake can be both had and eaten. All you need are concise, engaging posts that meet your customer-base where they're at. Fan Fuel Media is a Montreal-based collective of social media marketing specialists on a mission to help businesses effectively harness their online presence, particularly via social media forums. 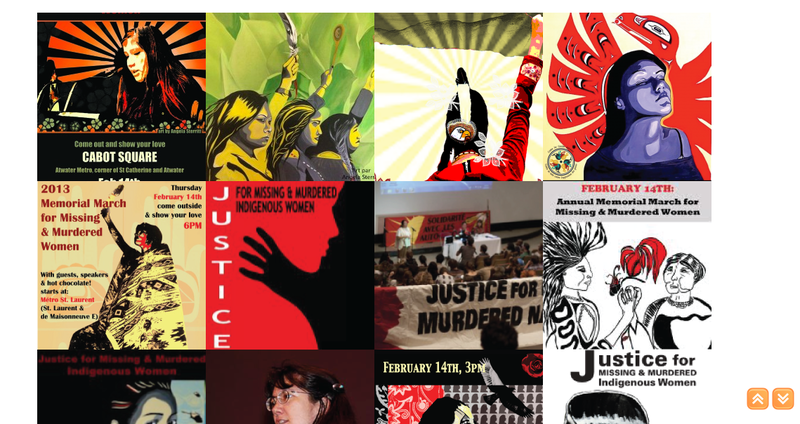 I worked at the Centre for 6 years, where I got to combine my skills as a writer and my passion for social justice to reach as many people as possible and effect real change. In myr time there, first as Volunteer Coordinator, then Promotions Coordinator, then Campaigns & Programming Coordinator, I wrote endless press releases, web copy, campaign letters, and copy for posters, flyers, pamphlets, and a lot more on behalf of the organization. I also designed promotional materials on a regular basis, gave writing workshops to volunteers, and managed all social media accounts on a daily basis. The result was nothing short of remarkable: hundreds and sometimes thousands of people attended the Centre's events, largely as a result of highly effective web copy and print materials, and a well-oiled social media machine. 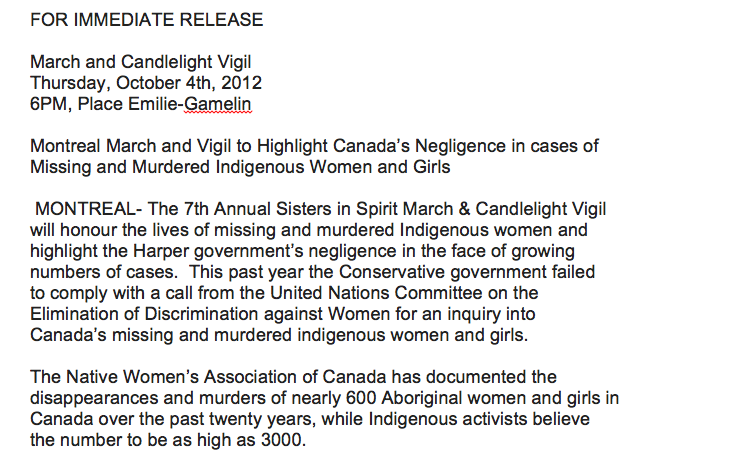 And the media showed up in droves at our press conferences and events as well. If you want to make a difference, change the story. Be the storyteller. That's what I did, and what I do, exceedingly well. Just saying. The Centre for Gender Advocacy is an independent, student-funded, Concordia University organization, mandated to promoting gender equality and empowerment particularly as it relates to marginalized communities. This mandate is achieved through ongoing programming, campaigns, resources, services, advocacy and a commitment to accessibility. Because Ling was starting a business completely new to the country and city she was addressing, she needed a skilled writer to fashion web copy for her site that could get to the heart of that newness, while simultaneously touting the proven benefits of her service. She needed a writer to take her raw thoughts and make them thoroughly informative. Accompanied by the kind of tenderness that any mother taking her baby to a spa wants to encounter, of course. Success? Check. The first of its kind in Canada, iFloat Baby Spa introduces an unfamiliar approach to health and development for babies. It provides a serene, rejuvenating, magical experience for parents and their wee ones alike. Studies show that allowing your baby to go back in time and relive the womb is actually beneficial in a number of surprising ways.